We saw this one coming. Everyone’s favorite smart thermostat, Nest, is now ready to take over your entire home with a new protocol that lets all kinds of devices talk to each other quickly and seamlessly. It’s called Nest Weave. Nest Weave’s primary objective is to make smart homes less dumb. In fact, the Nest team is pushing a novel phrase to describe what its software creates: “the thoughtful home.” The verbiage makes sense, since most people probably don’t want their homes to become artificially intelligent or weirdly automated. So now, products marked with the “Works With Nest” logo will talk to each other more gracefully and efficiently. Nest Weave is designed to make your home more intuitive, more helpful—more thoughtful. What does that actually mean? It means that Nest Cam will sense motion when your house is empty and turn on the lights as if someone were there; the ability to leave your house and knowing the door will lock itself; and that that these things will happen almost instantaneously thanks to the unique mesh networking approaching. Once again, this isn’t a big surprise. Google teased its Weave program earlier this year and even noted that it was built by Nest’s engineers. (Google bought Nest last year for $3.2 billion.) Nest Weave is a proprietary protocol that manifests itself as an ambitious push to put that technology in millions of homes. Using the Thread protocol as well as wifi, Nest Weave creates a de facto mesh network between your devices that ensures devices throughout the house work well with little latency, regardless of how far they are from a router. 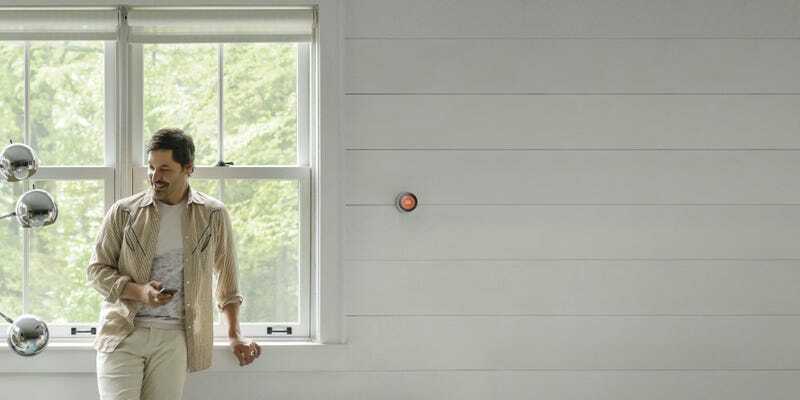 Meanwhile, a Nest product—either the Nest Thermostat, Nest Protect, Nest Cam, or any combination of the three—will operate as hubs of sorts to keep everything connected. There’s the rub: You need to own a Nest product to take advantage of Weave. But with the Nest Protect starting at $100, you can get the functionality that other home hubs offer without the need to buy a hub, a device that otherwise does nothing besides link your smart home devices and take up space. If you happen to go for the Nest Cam, you’ll get to take advantage of new features in your devices thanks to a new camera API that developers should love. On that note, the new family of devices that will support Nest Weave sounds pretty robust. The new Linus lock by Yale (pictured above) is the first company to officially support Nest Weave. It comes with a laundry list of useful features from the ability to check when your door is open and closed to the luxury of setting up friends with custom pass codes that offer different levels of access. Other companies on board with Nest Weave include—but are not limited to—Philips hue, August smart locks, SkyBell, Lutron, GE, and iHome. Quite conveniently, Nest is also launching the Nest Store, so that you can shop for all Works With Nest products.